Just recently I had a local here in our small town who knows I am a writer walk up to me and ask me how “my book” was coming along. I get that question a great deal and have no idea how to answer it. None. Zero. Zip. The reason I can’t answer the question is based on the problem in the question and the problem in what I know the questioner knows. If that person knew I could finish a new novel every two or three weeks if I wanted, they would be shocked and more than likely not talk to me anymore. I also know the local friend just doesn’t understand the difference between me being a Writer and me being an Author. And honestly, most people don’t understand the difference. They think that once a book is written, the Author is done for a long time. My friend thinks it takes a very long time to write any novel. My friend thinks that books are special things, to be put up on some high pedestal and worshipped. These assumptions my friend makes about my writing are not worth my time to try to correct in a quick social interaction. So often I just play along with the assumption by saying, “Coming along great.” That answer makes my friend happy and all is well and the topic is changed. And since new writers come out of that same basic training as my local friend, new writers don’t understand the difference either. And they think the same things about novels when they start writing them. It takes time and training and discovery and education to get past the myths our culture puts on writing novels. Most writers, sadly, never get past the myths and thus remain authors instead of writers. — A Writer is a person who writes. — An Author is a person who has written. Sounds like the same almost, doesn’t it? Nope. Those two are very, very far apart in reality and only cross in one main way: Writers are Authors as well, but Authors are seldom Writers. For example: I am the Author of two original Men in Black novels. They took me about three weeks each to write. And I moved on and have written seventy or eighty novels since. And I am still writing all the time. But I am the AUTHOR of those two books. If I had stopped writing new work after I finished those two novels, I would still be the Author of those two novels. But I would no longer be a Writer. — A Writer is always focused on the story they are writing at the moment, always focused on the story coming next to write. — A Writer is always focused on the future. — An Author is always focused on what they have written. — An Author is always focused into the past. When a person who is an Author at heart finishes their “master work” known as “their novel,” their attention turns at once to making sure all their work on “their novel” isn’t wasted. So now the Author has two choices. Send it to an agent, as is the myth, or indie publish it. Most Authors go the traditional route because of a thousand reasons, all silly, such as “My book will get more attention.” Or, “I want the publicity team on my book because it’s special.” Often these Authors will run into a new agent who will play into their need for perfection and have them rewrite “their novel” a number of times more, turning it from white paste to pure nothingness. Or the Author can indie publish, but this brings on other issues such as silly needs for “editors” and “cover designers” to make sure “their book” doesn’t get hurt. And then the big day when the book is published on Kindle. (Forget all the other places, right??? Only Kindle matters, or so the Author has heard…) Now the Author watches “their book’s” sales numbers every hour, getting discouraged when there are no sales in two hours. And then the Author starts the promotion on Twitter and Facebook and so on and so on and so on. Promotion is now all the Author thinks about day and night, because after all this is their “master work” and “their novel” so it deserves their respect and time and promotion. Story is done. Cool! Get a few friends to proof it while the Writer gets started writing the next story. Proofing is done, Writer spends a little time learning how to do a cover and blurbs, gets the story up on all the sites, all the while working on the new project, annoyed that the last project is taking his time away from the next project. Book is indie published quickly and Writer goes back to work on next project, finishing it and getting it proofed while he starts the next project. Writers, besides announcing a book or publication on a web site, don’t do promotion like Authors do. They can’t, because their focus is on writing the next book and the next story. They don’t have time. Writing time is more valuable than promotion of an old book. Writers tend to believe that their own writing is the best promotion. — A Writer is a person who writes the next story. — An Author is a person who spends their time promoting their last story. — A Writer gets feedback from the simple act of writing and finishing stories. — An Author must get feedback from external sources such as reviews, sales, promotions, editors, workshops, and so on. Actually, a Writer doesn’t have to do anything unless they want to move over to the Author side. It’s the Authors who are making up all these rules. All Writers need to do is write the next story and when it’s done, get it to readers and continue on writing the next story and the next and the next. And that’s the point I am trying to get to. Each person must decide why they write. Is it to be published and get acclaim? Then you are more than likely an Author. If you write because you love to tell stories, love the fear and the joy and the excitement of entertaining yourself while telling stories, then you are more than likely a Writer. 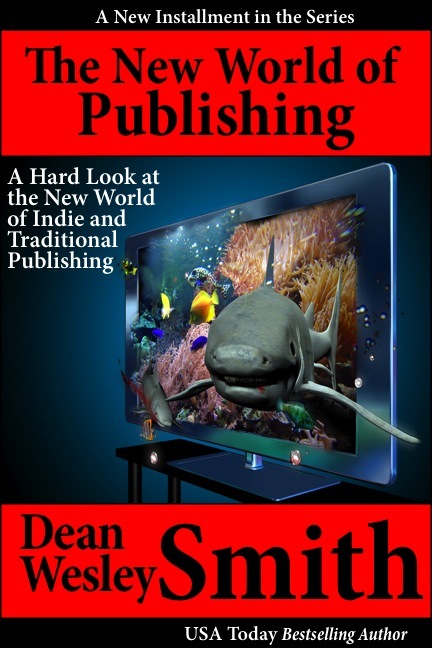 This world of indie publishing has opened up vast opportunities for Writers. But it is also going to really, really divide the Authors away from the real Writers. I’m watching it happen. But… Aren’t You Teaching a “Promotion” Workshop? Well, sort of. When we scheduled the workshop last year, we couldn’t come up with a better name. Scott William Carter and I are teaching it and we both are Writers. In fact, we both pretty actively hate and laugh at all the people who spend all their time promoting their past books instead of writing new ones. Both Scott and I believe completely that the next book is the best promotion for the last book. So we are officially calling the “Promotion” workshop “The Toolkit for the Indie Writer” workshop. This will cover a ton of things indie Writers just need to do in the process, such as web sites, cover design, tools to be more effective, writing better cover blurbs, linking, getting your books easily into bookstores, and so on. Not a bit of it will be about how to use a social site to drive your friends crazy with your constant promotion. And trust me, if we do it again, the word “promotion” will not be in the title. A Writer is a person who writes. An Author is a person who has written. Check in with yourself and see where your focus really lies. It’s one thing to be afraid to not start the next story or novel and use “publishing” as an excuse for a short time. But if that short time turns into weeks and months and your focus is only on your sales of your published work, you are an Author. And if you want to be an Author, that’s fine. But just realize one thing. Authors are missing the best promotion tool there is for their old books. Thank you! Until mid-2014, I did exactly what you recommend in this article. And I was making a very good living. But with the introduction of Kindle Unlimited, I changed my focus to marketing. I’d been publishing several new books and novellas every year for three years and that all but ground to a halt. In the past two years, I’ve only published a total of five new works – one was a non-fiction thing I’d written at some point in the past, and another was a collection of four short stories – so only three novels. In two years. A couple of weeks ago, I realized I was just throwing good money after bad with advertising and it was time to get back to what worked – writing. Finish one book, start the next, etc… So my goal for the rest of 2016 is to write two novellas, three novels, a cookbook ‘by’ the characters from my first series, a few short stories for my newsletters, and edit a standalone book that doesn’t sell well so it includes a few characters from that first series. And remember, Kristy to get back to having fun with the writing as well. That really is the key.